Celery – Rich in vitamin K and also contains folate, vitamin A, potassium, and vitamin C.
Romaine Leaves – Excellent source of vitamin A, vitamin K, folate, and molybdenum. Mineral content includes manganese, potassium, copper, and iron. Pear – A good source of vitamin B2, C, E. Plus minerals, copper, and potassium. Rosemary – Rich in vitamin A and C. Rosemary is high in calcium, magnesium, and potassium. It also has a good amount of phosphorus, sodium, and iron. Ginger – A good source of Vitamin C, Vitamin B6 and minerals, Magnesium, Potassium, Copper and Manganese. Celery – Very low in calories – 10 calories per stalk. So, a great choice if you are trying to lose weight through juicing. It also helps with inflammation, stress and digestion. Romaine Leaves – Also very low in calories for weight loss. Surprisingly Romaine leaves are high in protein and also a good source of Omega 3 oils. The antioxidants in Romaine greens are reported to help prevent cancer. Helps prevent the build up of plaque around the heart. Pear – Good for immune function and healthy skin. Pears help lower Cholesterol. A good source of energy due to its high sugar content. Ideal for an energy boost. 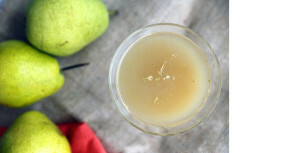 Pear juice also has an anti-inflammatory effect. They taste great too. Rosemary – Has great antibacterial and antioxidant properties, plus anti-fungal, and antiseptic benefits. Also thought to enhance memory and concentration. Ginger – Well-known for its numerous health benefits, including its benefits to the immune system, to increase your appetite, can prevent various types of cancer, aid digestions. Reported to enhance sexual activity(Nice one! ), and aids with nausea, and flu. All in all the above juice has a real concoction of health inducing properties. One you will definitely want to try soon and make on a regular basis.